Every undeliverable piece of mail costs your business money. Material costs, printing and postage, the time to prepare the mailing, as well as the cost of lost opportunities, such as unpaid invoices or low responses to marketing campaigns. Add to that the negative effect that late or misdirected mail has on your customers’ perception of your company, and it's easy to see how undelivered mail can dramatically affect your bottom line. With our Canadian Address Verification and Mailing Software, you can relax knowing that your Canadian mail is correctly addressed and postal-coded to comply with Canada Post® specifications. That means your mail is much more likely to reach its destination on time, while allowing you to qualify for incentive mailing rates. Smartsoft’s Canadian Address Verification and Mailing Software provide you with the most comprehensive Canadian address and mail management solution available. frameworks Canada corrects and standardizes your addresses using Canada Post® standards using the very latest Point of Call data. SmartSort presorts your mail in accordance with Canadian postal regulations. All of our Canadian Address Verification and Mailing software is SERP Certified™ for accuracy by Canada Post. US Customers in your database? No problem, we’ve got you covered. 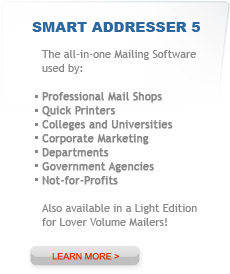 If your customer database includes US addresses, SmartAddresser 5 is the CASS Certified™ all-in-one mailing solution for U.S addresses, and is now available to Canadian customers. Updates to the USPS® postal database are provided through our web-based interface, so you are always assured of the very freshest data. Just Looking for Address Correction for your US address database? 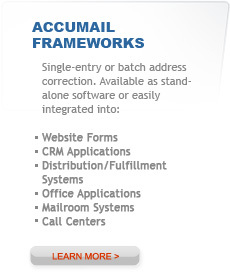 Then take a look at our AccuMail Move Toolkit, which provides CASS Certified Address Verification and NCOALink Move Update processing for US postal addresses via a web service. No updates to install - just instant access to unlimited address correction for the life of your subscription! © 2019 Datatech SmartSoft, Inc.